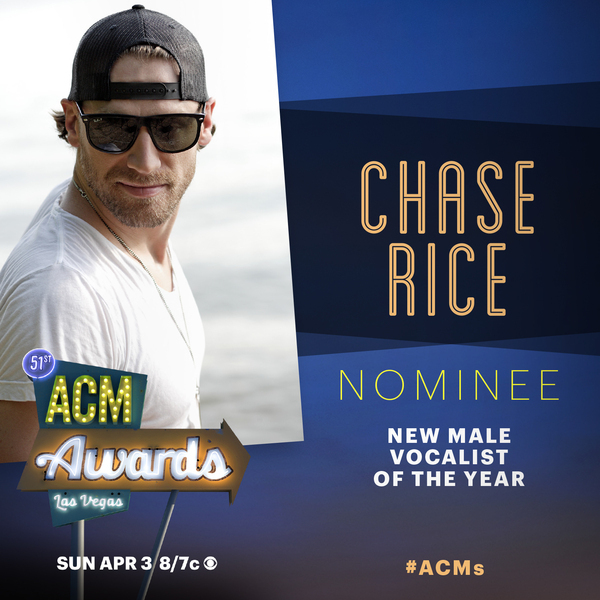 NASHVILLE, Tenn. – (Feb. 1, 2016) – Chase Rice has plenty to celebrate today after learning that he’s up for New Male Vocalist of the Year at the 51st ACM Awards while sharing news of forthcoming new music with fans. When the Academy of Country Music nominations were announced on CBS’ “CBS This Morning" earlier today, Rice--who has built his rabid following from the ground up-- had already planned to be in Las Vegas as part of the three-day ACM Party For a Cause Festival, but now Rice has even more of a reason to keep the party going through the Sunday, April 3 awards show broadcast from the MGM Grand Garden Arena in Las Vegas. Rice teased that new music last Friday when he posted a photo to Instagram with the words “SHHH … One Week From Now” and the hashtags #Whisper and #NewMusic 2/5. It’s the first new music from Rice since the release of his chart-topping debut album Ignite the Night in 2014. That album delivered two Top 5 hits, “Ready Set Roll” and “Gonna Wanna Tonight,” and established Rice as a vocalist, entertainer and songwriter to contend with. The artist who has been described as "a rarity" by ESPN, "convincing" by the New York Times and "clever" by the Associated Press just wrapped his third headlining tour, The JD and Jesus Tour, last week after supporting Kenny Chesney’s stadium tour last summer and is gearing up for a crazy year that includes the release of his as-yet-untitled second Columbia Nashville/Dack Janiels album. For more information, visit www.chaserice.com or follow him on Twitter @ChaseRiceMusic. For more information about the ACM Awards, visit www.acmcountry.com.